The egg cup without the cup. 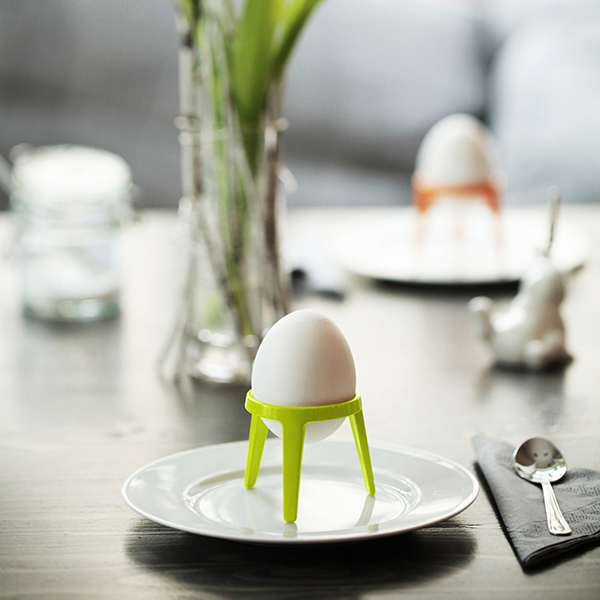 The most elegant way to enjoy your breakfast egg. This metal design piece is more than a classic eggcup. The breakfast egg rests safely in the wide ring. The three legs - together with the weight of the entire construction - lend great stability. It is not by accident that one might think of a launching rocket which also led to the products name "rocket". Weight, haptic and appearance gives rocket a high value and therefore it makes a perfect gift. Available in colors: white, black, natural (raw), orange, green, blue, red and turquoise. Since autumn 2017, we also offer a genuine gold plated version - our Gold Edition. for its outstanding design quality. We are constantly expanding our dealers network by finding new sales partners.